As the warm summer nights begin to fade and I start to pull things together for my fall capsule wardrobe, it has really got me thinking about how to store my summer capsule and keep my clothes lasting longer. 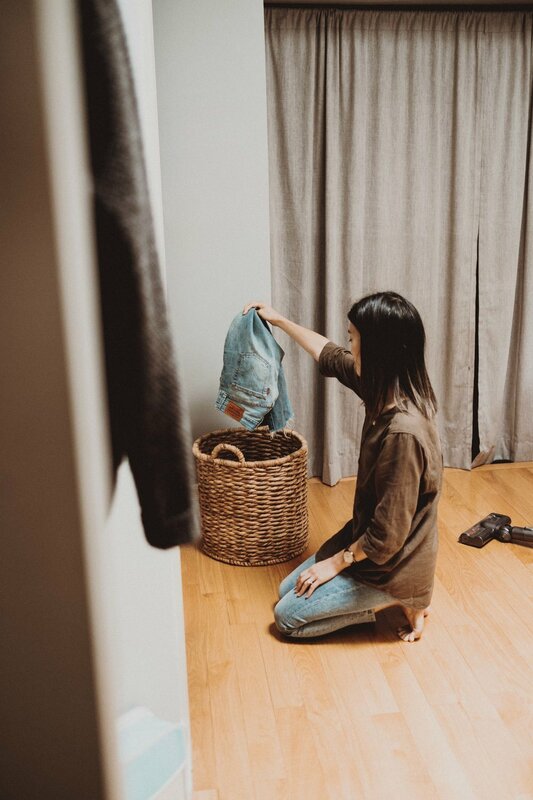 I'm all for purchasing quality pieces and having a long-lasting wardrobe, and I believe that a big part of extending the life of your wardrobe is in the clothing care. I have just recently started pursuing a more sustainable life, and though most of my clothing is fast fashion that I purchased in the past, most of it has been with me for a few years and will continue to last if I take care of it. A big part of slow fashion is not to go and purchase a whole bunch of ethical and sustainable clothes, but to appreciate and wear what you have. As we move from summer to fall, let's get into a few of the ways I prepare my wardrobe for a new season. If you know me well, you can probably attest to the fact that I'm a bit of an organizational freak. I really appreciate a clean space and for me personally, it really helps me to be more productive and creative if the space around me is not messy. This also includes my closet! My first tip for transitioning your wardrobe at the end of a season is to clear everything out of your closet. Give the shelves a nice wipe-down and vacuum up those dust bunnies that have been collecting there all summer. A new season gives you a new opportunity to organize and store your clothes well. Now that everything is out of your wardrobe, you can take the time to go through your clothes and separate them into three piles - keep, donate/give away, and repair. If you have a capsule, decide what you're going to keep as transitional pieces for the next season. For example, I kept a few of my summer camis that I know I can wear in the fall as well. Next, evaluate your wardrobe. Is there anything you want to keep to try to wear? Is there a piece you know you want to give away or donate? Once you've decided on those, take a look at any garments that may need repairing or maybe simple hemming job. I actually had two pairs of pants that have been sitting in my closet - one that needed to be hemmed and one that needed to be repaired. I plan to take these to the tailor soon! The next step is to wash your clothes in preparation for storage. Washing your clothes properly is so important in having a long-lasting wardrobe. Make sure you are reading and following the care labels correctly. I only ever wash my clothes on a cold, gentle cycle and hang dry almost everything. The dryer can be very harmful on delicate garments so I only put things like undergarments, bedding, and linens into the dryer. Since your closet is empty because of tip #1, it is now ready for storing your next season's selection! Proper storage is equally important for helping clothes last longer. I typically hang most of my tops except t-shirts and especially not knitwear - I'm sure we've all had the experience of hanging a nice knit only to find it's developed some strange ears when you go to wear it! My tip is to develop a storage system that works for you. I like to hang my tops based on sleeve length and my closet is also somewhat colour coordinated from light to dark, as I don't really have much colour in my wardrobe to begin with. Maybe for you, it's more practical to store based on colour or type of clothing item (activewear, workwear, etc.) - find what works best for you in terms of practicality and space! Now that you've gone through these steps, you're well on your way to enjoying your new capsule wardrobe!